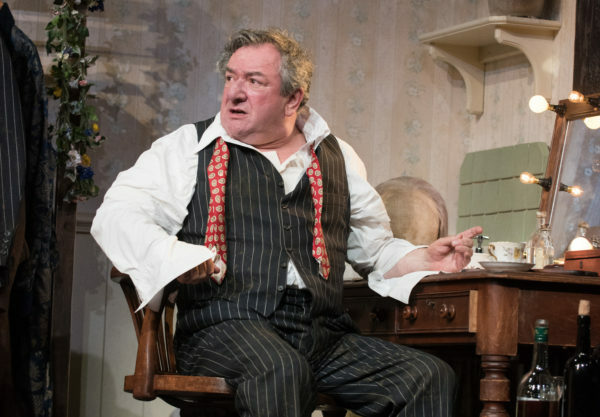 Actors acting as actors: Tracey Sinclair reviews a revival of The Dresser ahead of its London run, with two excellent performances from Ken Stott and Reece Shearsmith. The Dresser at the Theatre Royal Brighton. Photo: Hugh Glendinning. If there’s one thing actors seem to love, it’s stories about actors – especially ones that are mean about actors, interpret that as you will – so it’s no surprise that Ronald Harwood’s piece about an ageing thesp with delusions of grandeur has had a number of adaptations (most recently the BBC’s glossy licence fee bait featuring Anthony Hopkins and Ian McKellen). Ken Stott and Reece Shearsmith might not match those actual Sirs in terms of Hollywood star power, but both turn in compelling performances in a production that is poignant, moving and often very funny. Stott is ‘Sir’, a past-his-prime actor-manager touring the provinces during the Second World War, and driving himself and those around him into the ground in doing so. He is mentally and physically disintegrating – forgetting his lines, behaving badly, and prone to fits of crying – but refuses to give into the advice of either his doctors or his long-suffering ‘wife’, Her Ladyship: bombs may be falling around him and he may be falling apart, but the show, after all, must go on. The only person who seems to understand this is his dresser, Norman (Shearsmith), who fusses, cajoles and scolds him into action, as if both of their lives depend on it. For a play that is about getting old and losing one’s faculties, The Dresser is far funnier than it should be: lacerating lines, snide asides and plenty of digs both at actors’ egos and the ramshackle nature of regional theatre means the laughs come thick and fast. But it’s a piece that stands or falls on its central performances and the chemistry between its leads, and here Stott and Shearsmith excel. Stott is mercurial, monstrously egotistical and utterly self-absorbed, but so convincing in his deterioration that it’s impossible not to have some sympathy for him, while flashes of impish charm hint at the reason so many people have cleaved to him for so long. Shearsmith, meanwhile, is a perfect foil – while he doesn’t quite nail the histrionics in the final act, his is a lovely, nuanced and multi-layered performance. Anyone who has ever dealt with a mentally failing partner or relative will recognise the determined cheerfulness with which he tries to steer his charge, and the bubbling maelstrom of emotions beneath it: the frustration, fear, exasperation and anger aimed as much at a terrible situation as the person entrapped in it. Beneath the waspish (if increasingly tipsy) façade is a man who has adapted a persona of dogged, upbeat practicality, both as a way of dealing with ‘Sir’, in whom he has invested so much emotional capital, but also as armour against a hostile world, where homophobia is dangerously ever-present, institutional and casual. Their relationship, uneven and unhealthy as it is, is never less than believable, and is the beating heart of this excellent production. The pair have strong support, especially from the main female roles. Harriet Thorpe’s Her Ladyship is a woman whose haughty froideur hides a life of disappointment, while Selina Cadell’s Madge, though slightly underwritten, is sympathetic as the spinster stage manager, failing to see that as she stoically mourns that she didn’t get the guy, Her Ladyship regrets that she did. Although it’s slightly overlong – the taut first half is a race against the curtain rise, after which the second half perhaps inevitably feel more rambling and unfocused – director Sean Foley never lets the action sag, even though some of the subplots feel a little superfluous. At least the second half, when the action switches fluidly from dressing room to backstage, allows us to get full mileage out of Michael Taylor’s inventive set, which sees us move smoothly through the bowels of the theatre. Harwood’s own experience as dresser, which served as his inspiration, imbues affectionate verisimilitude to the portrayal of the theatrical life that one suspects still holds up today – the camaraderie, the makeshift inventiveness, the petty spats and squabbles of a group of people forced into such proximity. But the piece also has a sense of history, an elegy to the kind of company that no longer exists. Just as the bombs are changing the face of the country, the war is changing the audience and, perforce, those that cater to them. Sir and his ilk are dying out, and once they are gone – for better or worse – there will be no one to replace them.